It’s hard to criticize well. The dangers are numerous- pride, misrepresentation, and imbalance are always a threat; not to mention those parallel temptations of timidity, revisionism, and hero-worship. Especially among the people of God, the call to discernment (which requires a critical eye) is always difficult to navigate. Yet navigate it we must. God has called us to neither combativeness nor cowardliness, but rather to a charitable clarity which is willing to both give and receive a friendly critique. 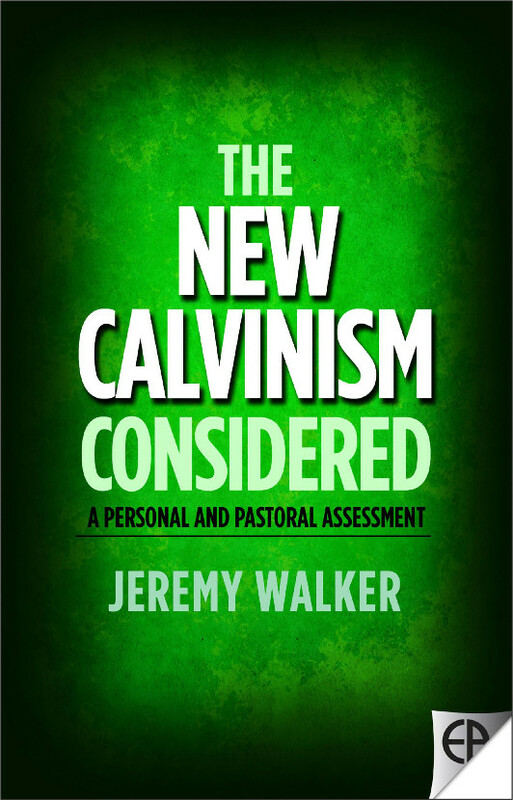 With all that in mind, I received a copy of The New Calvinism Considered by Jeremy Walker in the mail last week with great anticipation, eager to see how one from my own denominational circles (Confessional Reformed Baptist) would offer criticism to a group that played a key role in my own Reformation. More on that at the end of this review. Walker offers in this book what he describes as A Personal and Pastoral Assessment. Although much of this material has existed online in various formats for a few years, it is helpful to have it all condensed, expanded, updated and well presented in this new volume. Having read Collin Hansen’s Young, Restless and Reformed a few years ago I would say that Walker supplies what that book left many asking for- a careful and clear evaluation of the New Calvinism movement. To be clear- Hansen approached the topic as a journalist rather than a pastor, and so the sort of interaction Walker is able to offer was beyond his scope. While interested readers may benefit from reading both volumes in tandem, if I had to pick one it would clearly be Walker. Rather than fully summarize the contents of the book, let me simply share with you four reasons I can heartily commend it. Walker has committed what some in the academic guild seem to consider the unpardonable sin, yet which this Calvinist considers near visible proof of divine election- he has written a substantive book that is clear, engaging, and exactly as long as it needed to be. Although there are occasional points at which it has the ambiance of modified teaching notes, on the whole it is that happy combination of an easy read which is always telling you something important. It is even occasionally funny- a trait I believe was actually intentional. On page 44 Walker concludes his section commending the “grace-soaked” nature of much of the New Calvinism. He call his fellow traditionally Reformed observers of the movement to ask themselves hard questions over whether or not they have let their own delight over God’s grace cool to the point where it has become “familiar or suspect.” He even personally owns his own propensity to arrogance on page 98. While this review opened by acknowledging the inherent difficulties in offering (even needed) criticism, a man who is able to humbly admit his own faults and be self-critical is the sort you want to tackle the task. An entire chapter is given over to commendations, and while there are sometimes caveats and critiques nestled among them, these commendations come off as thoroughly genuine. Furthermore, when he does criticize I appreciate that Walker takes the time to say that the New Calvinism is hardly monolithic. He doesn’t impute the sins of its more radical fringes to its more chaste proponents. Both this willingness to commend brothers in Christ where they are commendable and to admit nuance and diversity among the New Calvinists has been a desperately missing ingredient from some of the more scathing evaluations which have been offered by others. It is necessary to offer criticism humbly and with an eye toward self-correction, but eventually the criticism must indeed be offered. I am thankful that Walker is willing to wade into some of the more concerning issues with eyes wide open, and I believe his good Christian testimony emerges intact (no small feet these days when it comes to intra-Christian criticism). Specifically, I am thankful for the way he openly and clearly deals with concerns which have themselves been open and clear for some time- the tendency of many in these circles towards forms of Amyraldianism and essentially Arminian methodologies, the clear pragmatism which some espouse with only minimal veneer, and the shameful way some of the worst offenders have spoken of sexuality while sporting a juvenile smirk. It is not unloving to point these things out. The fact is they are already been out for some time, at least for any who have cared to observe them. If you take up the book to read it, you can judge for yourself whether or not Walker handles his critique well. I believe he has, and I would simply ask that if you do feel he has not succeeded in his attempted nuance and humility, you will at least not let that fact cloud your evaluation of the concerns he brings to the table. Don’t shoot the proverbial messenger for pointing out what most anyone with five minutes and an internet connection can find for themselves. I started this out by mentioning that I was excited to read someone from my own denominational circles interact with some who had previously had a very real impact on my own theological development. In brief, I left broad evangelicalism in a reaction against what I saw as the uncut pragmatism being offered in the Church Growth Movement. This departure led me into circles influenced by John MacArthur and R. C. Sproul. Early on I read a Walt Chantry book, but I had no concept of what a Reformed Baptist was, nor that anything like the 1689 Baptist Confession even existed. Eventually it was shown to me and I began to move in that direction, although without any church or councilors to guide me. For a few years I settled into an Acts 29 church north of Seattle and got a good taste of this thing called New Calvinism. I then made my way through various OPC and PCA congregations before eventually encountering other Reformed Baptists in the Pacific Northwest- meetings which eventually culminated in helping to plant a 1689 Confessional church, enrolling with Reformed Baptist Seminary, and eventually moving across the country to serve in the church I now call home. Why tack on this autobiographical blurb to the end of a book review? Because it may give the reader a sense of why I so appreciate the tone of this book. I fully agree with his concerns, but I am so thankful that he has not offered them in the manner I have heard and read others offer them. I now feel there is a good point of reference for conversation, a critique offered from my own camp I don’t have to apologize for. I also want to say something to those who have been very heavy handed not just in their concerns, but in the way they have impugned those within this movement personally. There was a time when I was a rank and file young man in one of these churches. Now I embrace a Confessionally Reformed Baptist identity. I don’t say that to exalt myself in any way, shape, or form- or to say that those who haven’t moved in the way I have are somehow lagging in their sanctification. Rather, my point is that if you are genuinely concerned, you should know that there are many within these circles who are eager to listen. A book like this would have been a real help to me as I worked through some of these very issues. In conclusion then: If you love the New Calvinism and bristle at any suggested critique (you know who you are), you need this book. It you loath the New Calvinism and get secretly giddy whenever one of its leading men makes a misstep (you know who you are) you need this book. Jeremy Walker has offered criticism in a careful, humble, and charitable manner- yet he has been clear. The current Calvinism, both New and Old, is in his debt. Nick, I also greatly enjoyed this book. And I didn’t know if I would, especially because I am a confessional Baptist which could be identified as a “New Calvinist” (I graduated from the Southern Baptist Theological Seminary, have attended T4G, appreciate the ministry of John Piper and others, etc.). What I found was a balanced assessment and insightful critique. Thank you for the review! Hi John, it sounds like we approach it the same way. Hope you are well, brother.